Growing up during the Second World War, H. Bruce Franklin believed what he was told: that America’s victory would lead to a new era of world peace. Like most Americans, he was soon led to believe in a world-wide Communist conspiracy that menaced the United States, forcing the nation into a disastrous war in Korea. But once he joined the U.S. Air Force and began flying top-secret missions as a navigator and intelligence officer, what he learned was eye-opening. He saw that even as the U.S. preached about peace and freedom, it was engaging in an endless cycle of warfare, bringing devastation and oppression to fledgling democracies across the globe. Now, after fifty years as a renowned cultural historian, Franklin offers a set of hard-learned lessons about modern American history. 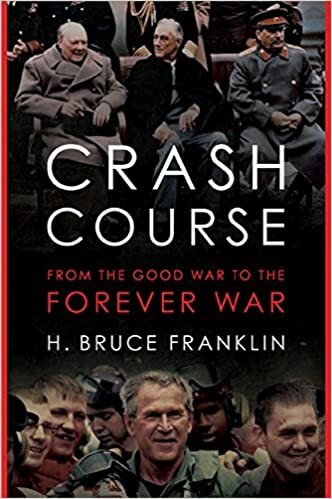 Crash Course is essential reading for anyone who wonders how America ended up where it is today: with a deeply divided and disillusioned populace, led by a dysfunctional government, and mired in unwinnable wars. It also finds startling parallels between America’s foreign military exploits and the equally brutal tactics used on the home front to crush organized labor, antiwar, and civil rights movements. More than just a memoir or a history book, Crash Course gives readers a unique firsthand look at the building of the American empire and the damage it has wrought. Shocking and gripping as any thriller, it exposes a decades-long deception of the American public and commemorates the millions who have been been continually fighting for peace and justice. Once a tugboat mate and then an Air Force navigator and intelligence officer, H. Bruce Franklin for more than a half century has been a progressive activist and renowned historian and author. His nineteen groundbreaking books and hundreds of articles have won him top awards for lifetime achievement in fields as diverse as American studies, science fiction, prison literature, and marine ecology.